For those who like to add reminders to their transactions, or need to keep track of what needs to go where and when, we've developed the ideal feature. Pandle Notes allows users to add general notes, which can be viewed under the Tools tab, and notes attached to a specific transactions, bank accounts, customers, suppliers, categories and invoices. Read on to learn how you can start creating notes in Pandle. To create a general note simply go to Tools > Notes. From here you can view every note created in Pandle by any user. You can add new notes and edit/archive existing notes. 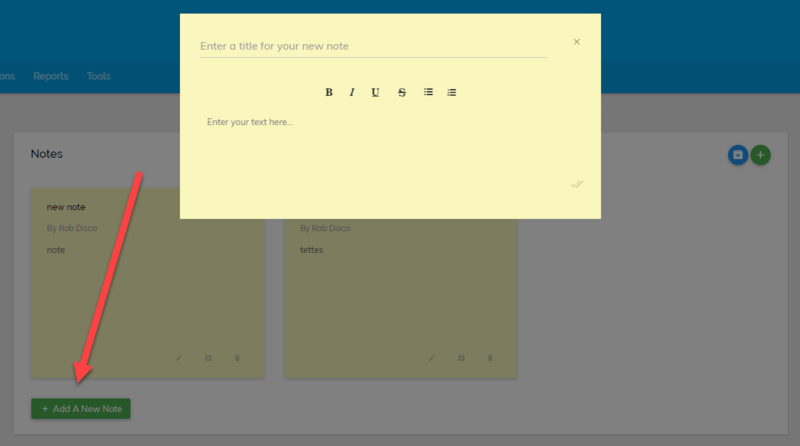 To get started simply click 'Add New Note', and then enter a title and the note itself. Click the tick box to save your note. Notes are displayed in date order, so you will always be able to see the most recently created notes first. All notes include the date they were created on so you can easily see what period a note is referring to. To attach a note to a specific transaction or item, simply click the notes icon next to the transaction under the relevant tab. For example, to make a note against a customer account simply click the notes icon next to the relevant customer under the Customers tab. Once you have the note simply click the double tick to save. If notes have been added to this customer previously you will see arrow icons to the left and right so that you can look through each of them. Any notes added to transactions/items will also be shown under Tools > Notes along with a link to the associated transaction (under development). Tagging: Users will be able to tag other users in notes (including your accountant). They will then receive a notification to let them know they have been tagged in a note. Filtering: From the Notes menu users will be able to filter and search notes. You will be able to filter notes by user, transaction type or date range. More transactions/items: We are working on adding the notes icon to all types of transactions and items such as all those under View Transactions, Suppliers, VAT Returns and Projects. Task lists/reminders: As part of our Pandle Organiser work, users will be able to add tasks to notes, which in turn will trigger reminders.